This is a LHC-like like detector based on the Silicon Detector concept. It combines best features of the ATLAS and CMS detectors. See arXiv:1309.1057, Snowmass Energy Frontier Simulations, J.Anderson et. al for details. This detector design attempts to be as close as possible to the DPF fast simulations implemented in Delphas program used for Snowmass 2013. The HCAL is about 7.5 lambda, but it has 45 longitudinal layers (unlike ATLAS and CMS). The HCAL cell size is 20 cm x 20 cm (similar to ATLAS and CMS). ECAL has 4x4cm cells, which are smaller than for ATLAS LArg ECAL (5 cm, or 0.025 in eta-phi), but larger than BGO cells of CMS (2.2 cm, or 0.0175 in eta-phi). 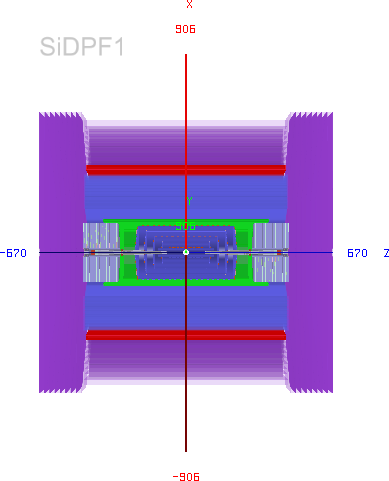 The detector uses the magnetic field 3.8 T as for CMS, similar to the DPF fast simulations.